Feeling:On the whole I’ve felt pretty well this week. I can’t quite believe I’m 28 weeks pregnant already. Having gone quite slowly for the first part, this pregnancy has started to fly by over the past few weeks. I definitely think that having the exercise of walking mum and dad’s dogs has helped get a bit more energy, so I’ll keep up the gentle walking now that I am home. 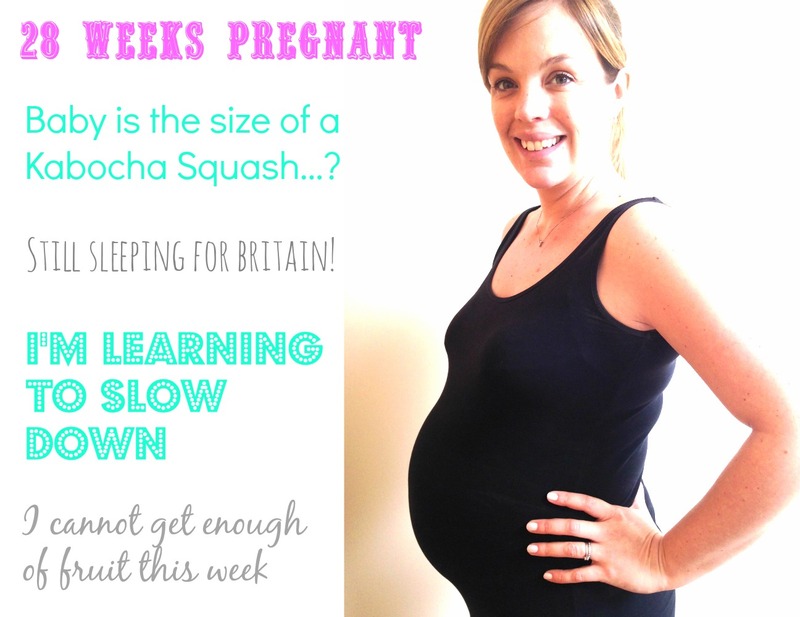 But I do think I need to learn when to stop now that I’m in the third trimester. On Tuesday last week, I was in the office, so I’d been up at 6am to walk the dogs, spent a day in the office, then spent an hour poo picking and suddenly as I went to drive home, I was hit with no energy. By the time I got home I struggled to even get up the stairs to get my PJs on. Problem is, in my head, I’m still the same independent, able bodied woman, but I think I need to realise that my body is under a lot more stress and I need to listen to it a bit more. I’ve often said recently about my horse now that he’s older, that he’s willing in mind but not in body. I think this is starting to apply to me too! Yesterday I headed out with the dogs in the morning and started to get a bit of pain in my pelvis area – a bit like a stitch pain. I carried on gently walking, thinking it would pass with exercise. Big mistake. When I got to just about the furthest point of my walk, about a mile away from home, the pain became unbearable. I can’t really describe it, other to say that it was like every stomach pain I had ever experienced rolled into one. I was in tears and started to panic, thinking that nobody knew I was there (Mr M was at work) and that I was going into labour! I’m not usually such a drama queen, but I think it was pure panic. I managed to plod on, desperate to get closer to home. I called my sister, who lives in the same village, so that someone knew where I was. After about 20 minutes, the pain passed completely and over 24 hours later, I have been fine since. By the time I got home, my sister came over, and I burst into tears, I had been so scared and felt very vulnerable. We checked the baby’s heartbeat on my doppler, which was strong and regular and it has been moving ever since, so I think it was just one of those things and nothing to worry about. What it has taught me though is invaluable. I will be taking it easier from now on. Staying closer to home and listening to my body more. Looking: Much the same this week. Although my mum has been away for ten days and said I had got bigger, so maybe I’m just getting used to growing. Craving: Fruit. I cannot get enough of it at the moment. Sleeping: Sleeping is continuing to be really good this week. Such a relief. Will my mum to-do list ever end?